Dark circle are common blemishes around the eyes, often caused by fatigue, anemia, genetics, certain medication and aging. However, once a woman reaches 30, the main cause is down to aging. This is when those dark circles start to become even more noticeable and even more prominent. Unfortunately, the older you get and the longer you leave baggy or dark eye-circles, the more irreversible the damages become. Thankfully with the application of Juliana.Francoise innovated Dark Circle Remover Serum, eye bags and unsightly dark blemishes become a thing of the past. 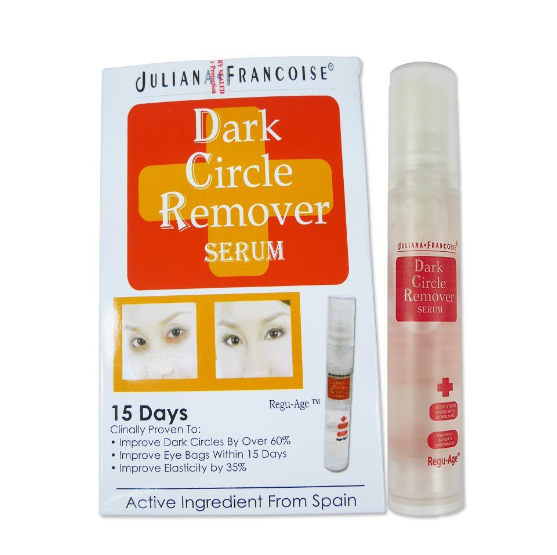 Juliana.Francoise Dark Circle Remover Serum is a potent eye circle remover with high concentration of Regu-Age ™. This patented cosmeceutical ingredient has been clinically proven to reduce dark circles and puffy eye-bags as well as subtle imperfections around the eye areas. Contains minute micro-particles that instantly penetrate into the skin’s surface to repair leaking capillaries and clear eye deposits for 24 hours. 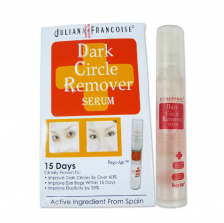 It can dramatically reduces dark circles and unsightly puffiness around the eyes. It is a powerful cosmeceutical which instantly strengthen the connective tissues, prevent UV damage, fill and repair the collagen underneath your eyes with effect that last up to 24 hours. Use daily every morning and evening. Apply a small amount of Juliana.Francoise Dark Circle Serum with your ring finger, gently tap around eyes and smooth the serum away with an outwardly motion.